The total build cost for Apple's new iPhone 5s is just under what it cost Apple to build its predecessor a year ago, according to a new report, while the iPhone 5c's total build cost likely allows Apple to grab a better margin. A forthcoming IHS iSuppli report obtained by AllThingsD posits that Apple spends at least $191 on components to build a 16GB model of the iPhone 5s and between $167 and $176 for a low-end iPhone 5c. Those prices are just a few dollars lower than what Apple spent in order to build the iPhone 5 according to iSuppli's year-ago report on that device. 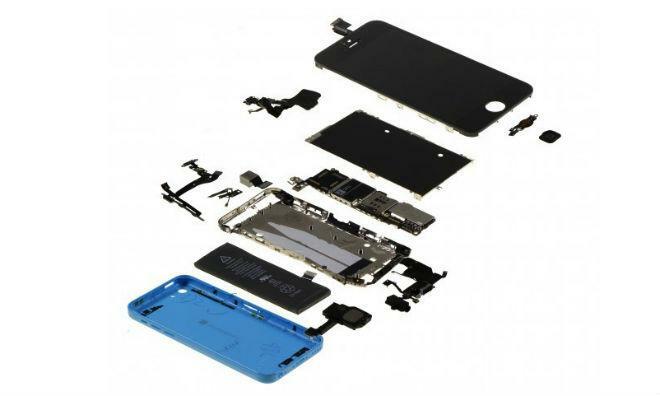 The firm adds another $8 in assembly costs for the iPhone 5s, while iPhone 5c assembly tacks on another $7 to assemble, giving full construction estimates of $199 for the 5s and between $173 and $183 for the 5c. The iPhone 5, released in 2012, cost Apple about $205 to produce and sold for between $649 and $849 off-contract. Apple saves about $13 to produce the new high-end iPhone, even considering its beefed up processor and biometric sensor, and Apple sells it for the same price point. Memory capacity plays a part in the price of an iPhone, with the jump from a 16GB module to a 64GB module adding $19 to the component cost, plus another $8 in assembly. The display components are among the biggest cost contributors for the device, though, amounting to $41 out of the component cost. IHS believes that Apple's displays came from a number of vendors, including Sharp, Japan Display Inc., and LG Display. The use of a polycarbonate shell for the iPhone 5c helps Apple drop the component cost of what is essentially an iPhone 5 even further. Whereas the iPhone 5 was machined from a single piece of aluminum in a costly process, Apple spends only $173 to build a 16GB iPhone 5 model and $183 to build the 64GB model. IHS' look at the new iPhones seems to agree with some observers' opinion that the iPhone 5s, despite the addition of a number of technologies, is more of an incremental progression over its predecessor. "I would say that they're almost the same phone," said IHS analyst Andrew Rassweiler, "except for that the 5s has the fingerprint sensor, the A7 processor and some newer memory chips that consume less power. Beyond that, they're basically the same." The lower production cost per unit could work in Apple's favor going forward. The Cupertino company recently revised its guidance for the September quarter after selling more than nine million new iPhone units in the launch weekend. Part of that guidance revision was to orient investors to look toward the upper range of its previous estimate, possibly due to the improved margins on its hot-selling new devices.